The prevailing question around the Bills season concerned what their plan was for the immediate and distant future; the narrative was around rebuilding. That was especially disheartening following a season in which the team made the playoffs for the first time in 17 years. Taking a step back, likely several leaps back, is odd for a team and discouraging for fans. 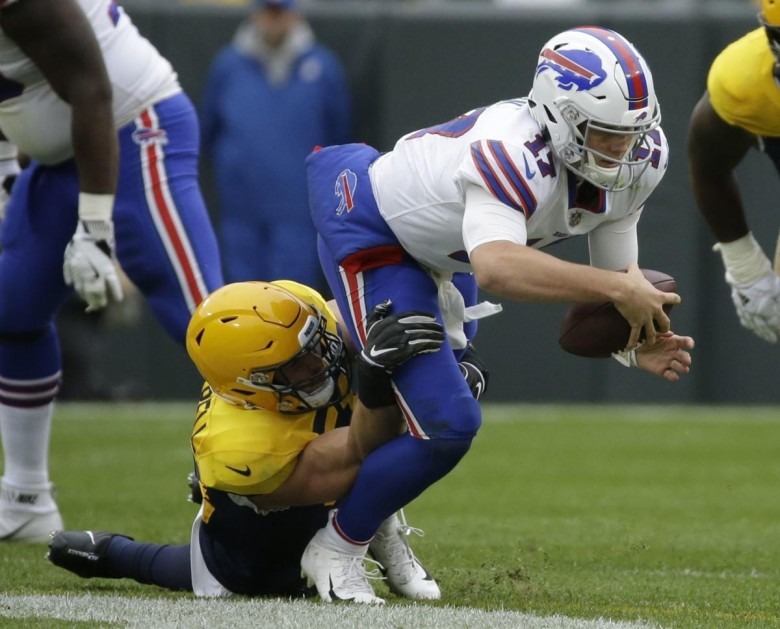 One week after the Bills shocked the Minnesota Vikings, they returned to their more consistent behavior, getting shut out against the Packers in unimpressive, uninspiring fashion. Fans have been told there is a process in place. And we are told to trust it. Or respect it. But it may be better to question and mock it. What is the process? And does everyone know it’s happening? Maybe we can try to figure it out. The phrase ‘trust the process’ arose when former Philadelphia 76ers President and General Manager Sam Hinkie had an idea and needed to motivate his team and fans. He was ostensibly saying that while we may not be any good right now (and we may or may not be purposefully tanking), it’s all part of a plan to get much, much better in years to come, so much so that you will forget the bad times and embrace all the championships we have wrought. Or something to that effect – it’s unclear when ‘the process’ ends. If it’s with a championship, the 76ers are still waiting. The centerpiece of the Sixers plan, Joel Embiid, nicknamed himself ‘The Process,’ and so much of the success of the plan rests on his health and success. I’m sure it wasn’t a new piece of sloganeering by Hinkie, but his consistent message became a mantra for struggling teams everywhere, a way to allay fans’ worries by telling them, without any evidence or legitimacy, better times are coming. The more you say it, the hollower it becomes. When the Bills admitted they were going to change directions with their team following a surprising playoff appearance, they took ‘TTP’ one step further (or backwards). The team this past summer filed to trademark the phrase, ‘Respect the Process,’ and I’m not sure I can figure if ‘respect’ is better or worse than ‘trust.’ I guess it means don’t mock the process, which absolutely, we will do. Of course, the Bills can’t even win (yet) at filing for trademarks, as the aforementioned Embiid is trademarked as ‘The Process,’ which may delay or deny the Bills request. The National Football League is fairly well set up to force turnover year to year, to assist the lesser teams and push back against stronger ones by means of draft position and strength of schedule. A salary cap is meant to even the playing field, and there are a bunch of divisions, particularly the NFC South and AFC West, that seem to annually experience upheaval. Unlike basketball though, where there often is a consensus handful of great players, and that player can turn around a team quickly where only five people are on a court at a time, the NFL is often more about the whole than the sum of its parts. Every team has different interests and needs, and there is great value to be had throughout the draft, provided you’ve a coaching staff, an environment, and some amount of luck to buoy your pick. If in basketball the process is losing on purpose to get the top pick in the draft, you’re likely going to get an objectively great player. There are plenty of variables, sure, but nowhere near as many as in football, where your team is much larger, playing with others is key, and coaching is paramount. The top pick in the NBA can play right away and be great; the top pick in the NFL may sit for a few games, for a year, or take time to develop into a consistent professional. Firstly, we must determine if there is a process and we all must agree. Someone in the organization thinks there is one because of the trademark filing. Head Coach Sean McDermott has been for some time now careful with his words, talking about winning now and later, but even this week he was resigned to admitting being in a building situation. Some players are on board while others deny it, at least publicly, those quotes suggest. LeSean McCoy, on the other hand, doesn’t know the team is rebuilding, doesn’t want to hear it, or doesn’t want to admit it. The team didn’t want to start the hopeful franchise QB Josh Allen right away; he was to play behind a veteran, but not Tyrod Taylor. But Peterman wasn’t good, so Allen can’t sit anymore. They want to protect him, and run the ball, but can’t account for offseason offensive line loses. They traded another QB that was competing to start. They traded a pick for a WR they later cut. Another WR, Jeremy Kerley, was cut after week one having played all camp and preseason. The process involves being bad to get better players. If anything, the Browns have been processing for years, and it seems like maybe that is starting to pay off. The Bills on the other hand have just been in middling void, never being good enough to be fun and playoff-bound, but never bad enough to get a high pick. The last seven years they’ve won between 6 and 9 games. Now that seems like something you can trust. The Titans come to town off an impressive victory against the reigning Super Bowl Champions and appear to have indeed a real process that is working. They have been taking chances, essentially winning two games on a pair of savvy calls (a fake punt in week two and a fourth down play last week). They’re 3-1, losing their opener in a game that was delayed twice by lightning for over two hours. Their games sometimes aren’t pretty, but they have a plan. And that plan will lead them to victory (and cover) at New Era Field. Trust the Process.